On February 10 in Donetsk, Ukraine, Isinbayeva broke the world indoor pole vault record again, by clearing 4.93 metres. It was Isinbayeva's 20th world record. At the European Indoor Championships in Madrid, Spain Isinbaeva won gold with a new indoor world record of 4.90 m. In July 2005, Isinbaeva broke the world record four times over three separate meetings. 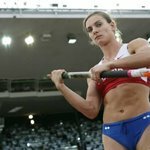 First in Lausanne, Switzerland, she added an extra centimetre to her own mark clearing 4.93 m. It was the 14th world record of Isinbayeva's career coming just three months after she broke her own indoor mark (4.89 m) in Lievin. 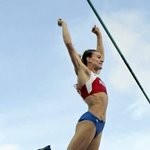 Eleven days later, in Madrid, Spain, she added an additional 2 cm to clear 4.95 m. In Crystal Palace, London on July 22, after improving the record to 4.96 m, she raised the bar to 5.00 m. She then became the first woman in history to clear the once mythical five-metre barrier in pole vaulting, achieving the monumental mark with a single attempt. 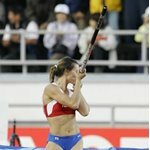 After the women’s pole vault final at the 2005 World Championships in Helsinki, Finland was delayed due to extremely bad weather conditions, Isinbaeva once again broke her own world record, performing 5.01 m in her second attempt, and winning the competition with a 41 cm margin of victory, which was the greatest margin ever obtained in any World or Olympic competition for the event.This was already the eighteenth world record in the career of the then 23-year-old Isinbayeva and her successful season was crowned with her second consecutive World Athlete of the Year award.